At least Daz finds time to play around with eye candy instead fixing all that annoying bugs and missing features first.. Yes, but it's a visual medium. I know I'm relatively new here, but isn't this why DAZ accepts products for testing based on their promos? People will complain about bugs but spend money at a site that looks great where they'll take functionality for granted and spend nothing at a site that looks meh (same as they will with products). Since you asked... I think the ladies outfits look a bit- breezy. I prefer less NSFW art to advertise a store. I don't really care about theoretical SFW content really, since I never understand that argument with this hobby anyway. BUT in this case I actually agree due to the content being sold. Stonemason should not need the ladies to sell the environments and I was actually going to make that statement earlier today. Not a Sci-fi person but I got some stone mason foresty stuff that I really dig. Do actually have one of the older urban sets too. I purchased based on the quality of the environments and the reputation of Stonemason. Also the forums talk nothing but good of this vendor. But then I thought for a minute. Showing off a nice rear or two does sell more to people in general. A lot of people don't come to the store SOLD on stonemason. Even those who are may be more likely to spend $$ if the advertising gets them in a spending mood. If they did an A/B test, Group A who is shown no ladies would spend less than the B group who was shown the ladies. That is how things works. So can't fault them for it really. Even though for me it wouldn't work in this scenario. I may like a nice booty, but i don't buy cars based on what I see in the lowrider magazines. -MJYou both understand that coding a web page is handled by different people than the ones who are Coding for the store and all the bells whistles and such. Much different work with much different code. I don't mind it - but it does break from the aesthetic of the rest of the store. Are there plans to do this with all store pages, all PAs, just some, or just Stonemason? You both understand that coding a web page is handled by different people than the ones who are Coding for the store and all the bells whistles and such. Much different work with much different code. Even if true, this means what? To me it means... Making the store look pretty takes precedence over making the store fully functional. Not necessarily. They are different skill sets. The folks that make things pretty aren't usually skilled in engineering. You always need a few art types working to keep banners and emails coming out. They also tend to handle landing pages like the one we are discussing here. Personally I think it looks great. Doesn't seem to render correctly in WebKit (Crome/Safari), otherwise, great idea. Well Kevin since DAZ3D is all about Art I would say it is prefect (for me) I find it a nice balance and apart from the halved sized images dotted through IE9 has no problem displaying the page/s. Yeah I like it. Hope to see more in the future. The div containing the "4" images has a width locked to 960px, if you make it 1000px will show all four images on the same row. I think IE ignores the width and makes it wider to fit elements (which is not how the standard is written). hi guys,I'm working on fixing the smaller images.they came about when the new store called on the main image instead of the original thumbnails,and the main image in several of my sets was in landscape format ,which didn't translate well. also working on a new bio as that one is around 6 years old and not up to date. ....I think IE ...is not how the standard is written). "We don' need no steenk'n standardz!" All working in Opera now. Only issues I see are a couple of squished promos, which Stefan says he's working on, and only two items at 30% off when I read the email as applying to Stonemason's entire store. Sadly, me too. I didn't bite during the PA sale and wish I had. I really love the realism of his work, but if things aren't on sale, I have a tough time paying full price. The 30% you are referencing is a coupon code given to Previous Stonemason customers. You must put Lava Planet into your cart with other Stonemason sets and use the code to get the 30% off those other sets. Kevin does that above statement mean I cannot use to 30% coupon on its own if I don't buy the Planet Lava? is some kind of "preview" or an existing product? Yes, of course the LavaPlanet is now in top ten of my wishlist items!! I suspect, as Stefan has done this in the past, that nice robot/mech is something he created for his own use, and not a "preview" of something to come in the near future. As far as the store page goes, I saw it yesterday and I like it a lot. I had no problem getting it to display as intended in my Firefox 9 (yeah I know I have to update) on Win 7 Pro. Selecting 60 per page works as intended, as does 30 per page. The Buy Now button works, though it took a few seconds to switch to the product page. Yes Miss B it is a model for future release...when, only Stoney can say. If I am not mistaken, that is how it was explained in the special mailing to Stonemason customers. 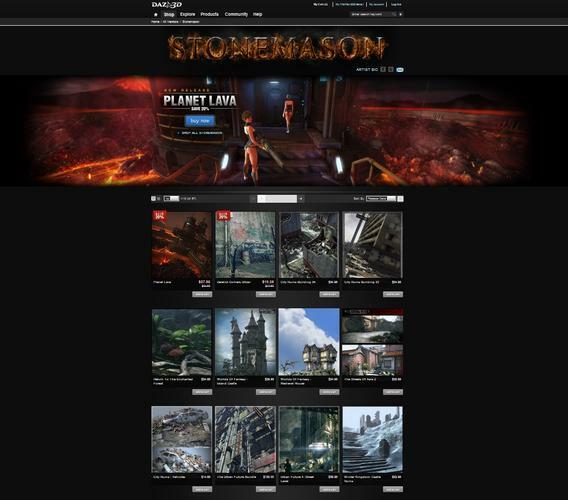 Save 30% on Stonemason's entire store when you purchase his latest release, Planet Lava. Confirmed, looks awesome in IE. I dropped IE because of Avatar issues and security issues. IE will be up dated to plug holes when will the Forums Avatar issue get resolved? Actually IE8, and expecially IE9, are considered just as safe and in some respects even safer than the other browsers, today. ...opens up fine in FF on my old 32 bit notebook. Has a lot of the feel of his personal website. I like it, but my bank card doesn't. I think the page is amazing. Beautiful, loads fast in Safari and the animation pops. I was able to increase the products view to 60 with no problems. The "view store" button is a bit of a waste of space, given you are at the store page already and clicking just pops you down the page a bit, but overall...bravo!